Laservision was commissioned by Al-Futtaim Group Real Estate(AFGRE) to design, create, install and maintain a 360-degree spectacular that would establish a new benchmark for tourist attractions around the globe. IMAGINE at Dubai Festival City is the result of years of research, planning and design, and spans over 20 acres across Festival Bay and Dubai Festival City Mall. 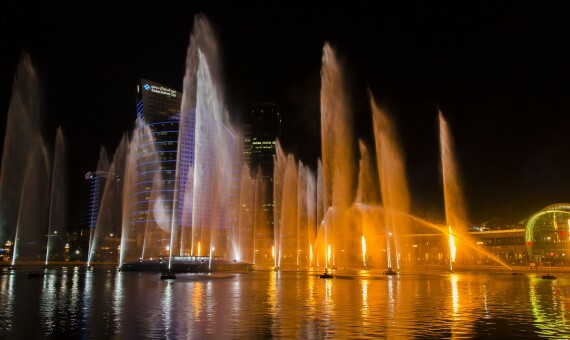 The spectacular runs 365 days-a-year, day and night, playing a variety of performances including: dancing fountain shows, architectural states, day time activations and customised immersive visual creations to entertain audiences of all ages. 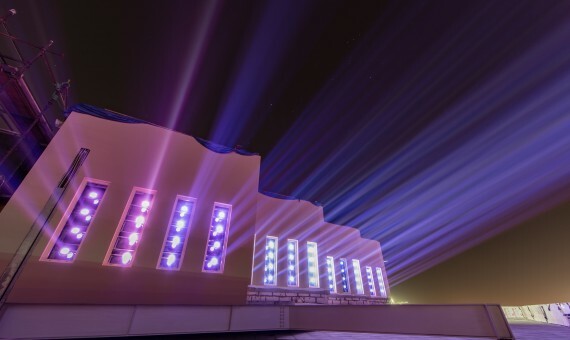 Skilfully combining the latest laser, light and sound technologies available, IMAGINE is one of Dubai’s most spectacular entertainment attractions. 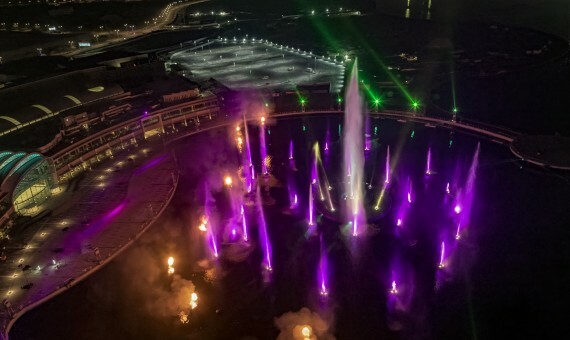 360-degree fountains, powerful lasers, record breaking water-screen projections, colourful LED lighting, and a towering video mapping projection on the InterContinental Hotel combine to produce one of the most technologically advanced shows in the world earning two Guinness World Records in the process. Laservision’s premiere spectacular, Stardancer is the first production to launch at the IMAGINE Attraction. Stardancer is a beautiful and artistic adventure of gravity personified (Stardancer) told though a ballet of contemporary dance. As Stardancer dances through the cosmos, she interacts with the planets and stars that surround her and overcomes the powerful forces she encounters along the way. Backed by a powerful original sound score, in high-definition 5.2 surround-sound, Stardancer skilfully combines contemporary and classical dance into a flowing narrative of beauty, struggle and the power of creativity. Stardancer stars award-winning dancer, Jessica Hesketh and features choreography by the world renowned Daniel Jaber. A Child’s Dream is the second production added to the IMAGINE Attraction and is an adventurous journey through the vibrant imagination of a young child. With airplanes, magical whales, a mystical tree-house and giant dancing robots, IMAGINE is set to a mix of fun-filled movements of modern pop, rock, and electronic music. 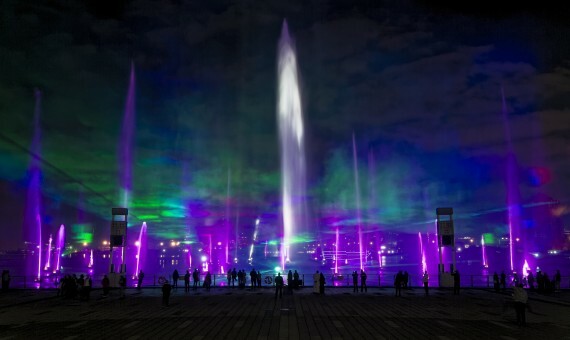 Laservision’s award-winning creative team combined water, light, sound and fire around an all new immersive stage set within Festival Bay and extending onto the InterContinental Hotel. These world record setting projections allowed the creative team to produce beautiful and vibrant imagery at an enormous scale. World-class video mapping projections take central focus on the entire south-side façade of the InterContinental Hotel producing an ultra-high-definition(UHD) projection surface, 450% larger than the world’s largest IMAX screen. 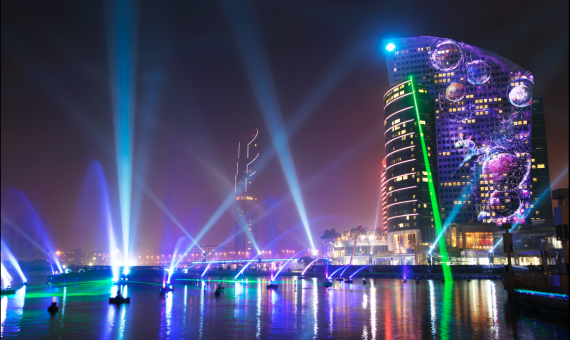 In addition to one of the world’s largest permanent video-mapped projection surfaces, Laservision created a world record setting water screen projection within Festival Bay, earning the Guinness World Record for “Largest Water Screen Projection.” Laservision’s creative team took full advantage of the immense space and provided an immersive “in the round” experience for Dubai Festival City visitors. Because of this approach, audiences can enjoy unique experiences as each location around the bay provides a new perspective into the beautiful story of Stardancer. Multiple full-colour, high-powered laser systems producing hundreds of light beams capable of being seen for up to 55 kilometres. Half-a-million watts of highly efficient lighting including over 250,000 energy efficient, intelligent Light Emitting Diodes (LEDs). Click here to see more of Laser vision work.